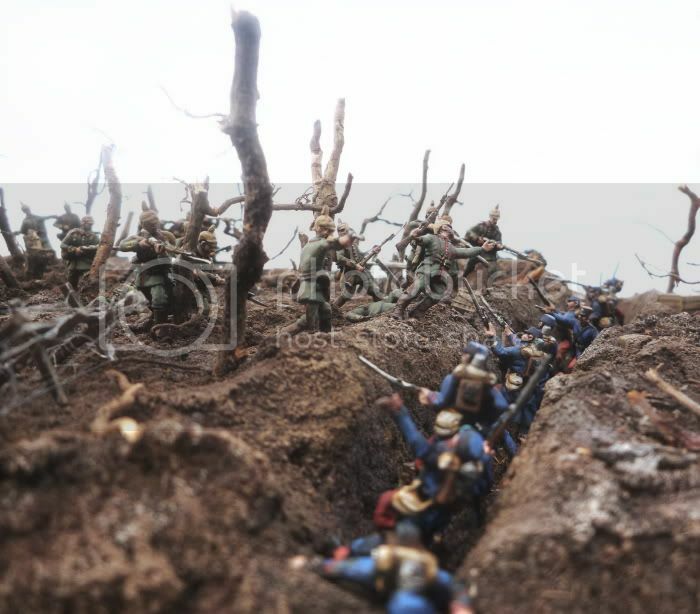 Argonne Forest 1914 by T. Dürrschmidt! All great entries in this competition so the winner is a great winner. A very beautiful scene I have "exchanged" the entries...i thought that this was of old wolf and robin revenge (and backdoor forest!!!) 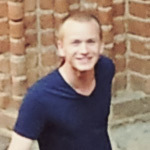 was Durrschmidt! This was my winner (the others were just favourites). Great work! I also voted for this one. Very good diorama. Thank you very much for the compliments and the votes. It´s always a little pity when you make "bigger" dioramas for the competition. Either you decide to show not every fig and detail you painted for it or otherwise you have to show very small pictures. Cheers to Chris (Modern Kiwi), Andreas (Old) Wolf and Roland Kupski for being good and tough opponents with colorful and creative works. 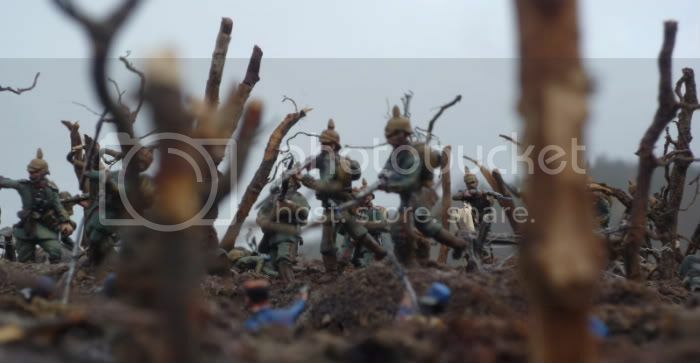 About the diorama: I wanted to show the contrast between a destroyed and grim landscape and outfashioned uniforms, used by the opposing armies in the early phase of WW1. This scene is located in autumn 1914 (the misty autumn weather helped with the photos). The Bavarian 21. Infanterie-Regiment "Großherzog Friedrich Franz IV. 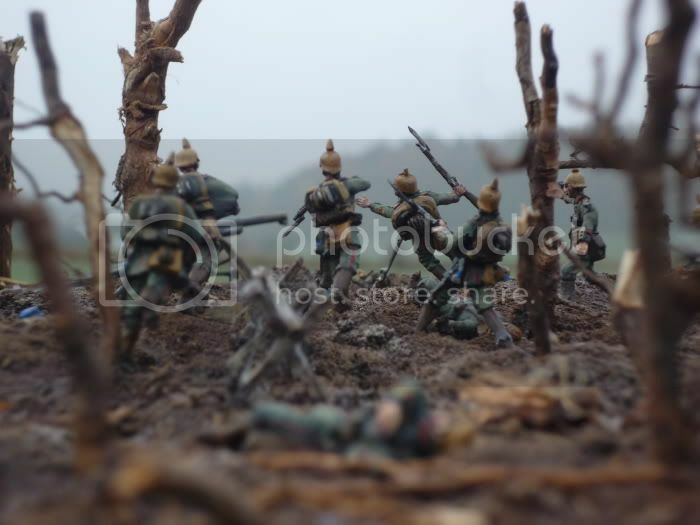 von Mecklenburg-Schwerin" (2nd Battalion was located in my native town Sulzbach) starts an assault on a French trench in a heavy shelled part of the Argonne forest. 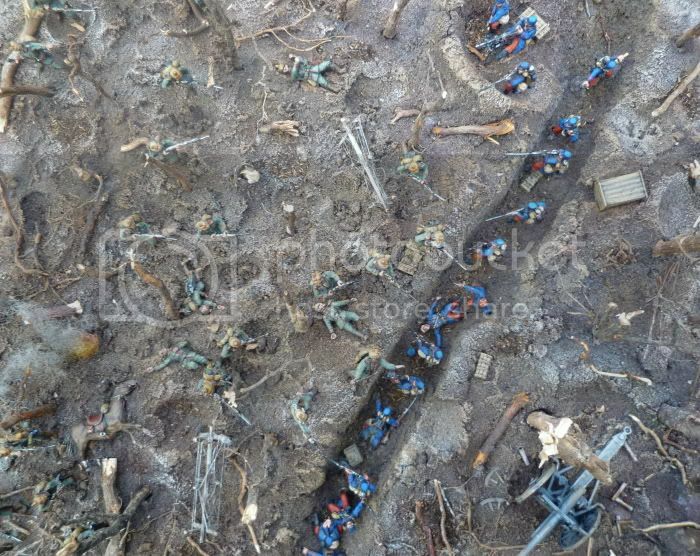 The trenches in 1914 were not the well protected earthworks from the later war. 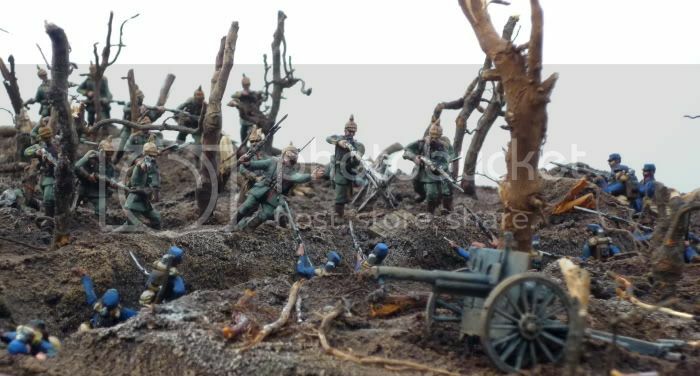 I decided to choose WW1 theme for I saw always a disturbing contrast between many huge trees and some little figs on a diorama. So I had the idea to show a destroyed forest. And this was the first time I used HAT-figs for a diorama and I was quite pleased with it. Had some problems to paint the faces but overall they are very good figs. Just added some self made plastic bayonettes to the German´s rifles. So here are some additional pics. Hope you enjoy. I woulda used that first pic! Superb work from you again Thomas. If we had seen even more of your work, I suspect we'd have voted for you even faster. A tough competition with no weak entries in my view, which makes winning even more special. Like that 2nd to last picture Thomas, the mist is great! Great on one of my favourite periods, a deserved winner, and congrats to all the other great entries too. Alrightm how did you the trenches!!! A very very good work, to which brush goes to the earned winner (like always)!